Since its inception in 1909, Picnic Day has become the crown-jewel event of the UC system and the signature event of UC Davis. One of the largest student-run events in the nation, Picnic Day showcases the richness of diversity and achievement at UC Davis and the surrounding community in the areas of research, teaching, service, and campus life. This year, the whole community celebrates its 105th year of tradition and success. This long-standing campus tradition began in 1909 when the University Farm invited the surrounding community to view their new dairy barn. Two thousand visitors attended, bringing picnics to complement the coffee, cream, and sugar provided by the University. 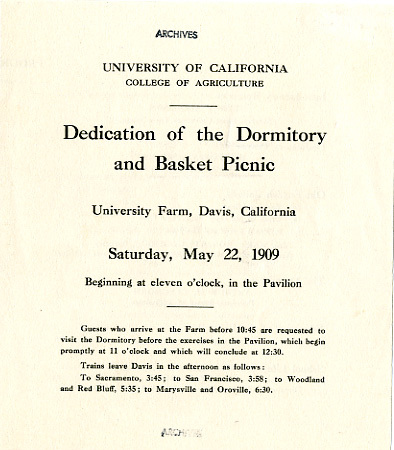 Following the success of the 1909 picnic, the faculty of the University Farm continued to plan and sponsor the event until a student committee took over the task in 1912. Through the years of Picnic Day history, the event has only been cancelled five times. In 1924, an outbreak of hoof-and-mouth disease among the cowherds caused the first cancellation. In 1938, delayed construction of the gymnasium, which was needed to accommodate the ever-increasing number of participants, led to a second cancellation. During World War II, the Army Signal Corps controlled the campus and Picnic Day disappeared from 1943 to 1945. Since 1946, Picnic Day has been growing strong and now boasts an annual attendance of more than 70,000 people. This year, there will be more than 200 events on campus and an estimated 75,000 visitors attending this special event. Emerging from humble beginnings as a tour of the University Farm’s new dairy barn, Picnic Day now offers a wide variety of entertainment and provides a host of opportunities for visitors to the Davis campus. Scroll through the timeline below to learn more about each year’s highlights. There was a jousting contest! Only one woman, Bernice L. Fry, was on the board. She was in charge of Women’s Activities. 939 students and 130 faculty members – a new record! was also a race from Davis to San Francisco (62 miles). Governor Earl Warren (of the Warren court, which ended segregation in schools) came to Picnic Day! The first-place float of the Alpha Phi ended up in flames! Due to rain, all outdoor animal events were canceled, but the parade continued as always!